The desk I use for my writing belonged to my great grandmother in the late 1800’s and was passed down to me by my grandmother. I still have the key! And when I unlocked the drop front after the desk was delivered to me, I found several late 1800’s tintype photos in elaborate leather frames, stashed in the a drawer – men and women who were probably related to me but sadly, no identification. I’ve kept the photos safely in the desk all these years, since they belong together. My grandmother and my great grandmother wrote genteel letters and poetry by hand at this desk. My late mother-in-law (who loved antique furniture) had it completely rebuilt and refinished as a wedding present to me in the 1970’s so it’s very sturdy again, which is a good thing since I sit here and pound away on my laptop’s keyboard as if it was the old Royal typewriter I learned to type on as a kid. 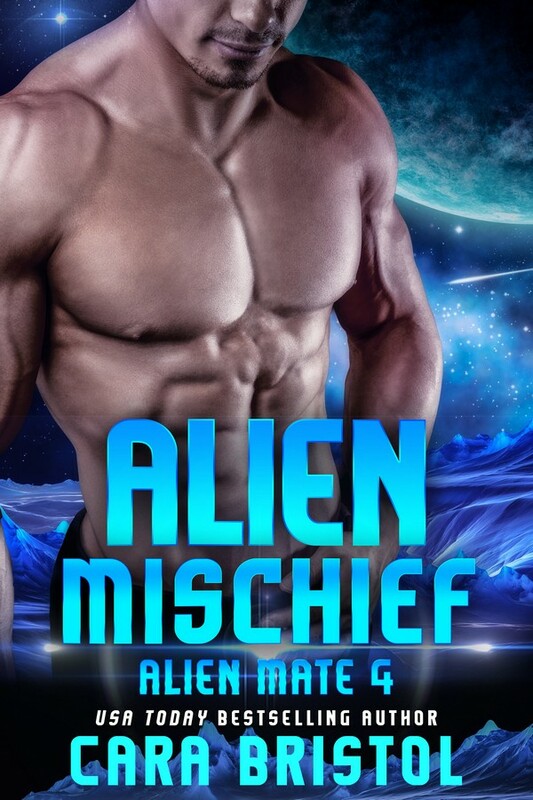 I write science fiction romance and ancient Egyptian paranormal romance and a lot of blog posts. No poetry! 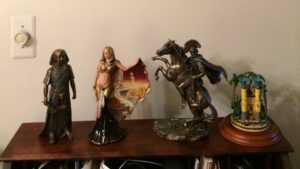 I keep a rotating cast of knickknacks on top of the desk – currently with an ancient world theme, but sometimes model robots from science fiction TV shows and movies, or even Lego creations from my grandson. 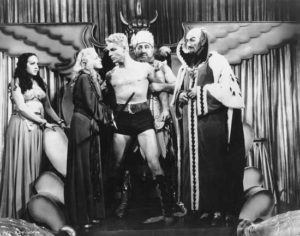 I have a photo from the old Flash Gordon serials that I keep close by, from a time when Buster Crabbe was the hero and the special effects were sparklers and spaceships suspended from strings. When I was a kid, the local TV station ran the Flash Gordon episodes every afternoon at 4PM and I was entranced by the exciting scifi adventures (with a dash of romance). I remember being pretty upset when someone finally told me how very old those shows were! But Flash and his beloved Dale (his varying cast of actresses playing Dale, I should probably say LOL) were one of my earliest inspirations to lean toward science fiction. My two cats, Jake and Keanu, keep me company when I write and they squabble over the chair next to the desk. Jake likes to steal it from Keanu, who then appropriates my smaller side table and demands consolation petting. Over the past few years I’ve downsized in stages from the large house where I raised my children to my present condo, now that I’m an empty nester. I’ve had so many garage sales and donated so much STUFF to Goodwill in the process! But I’m a knickknack person so I still have way more tchotchkes and fun things to look at than most people could probably stand outside of a store LOL. But it pleases me. The desk is in the living room and if I glance up I can see out my balcony, where I have a peaceful view of sky and trees. 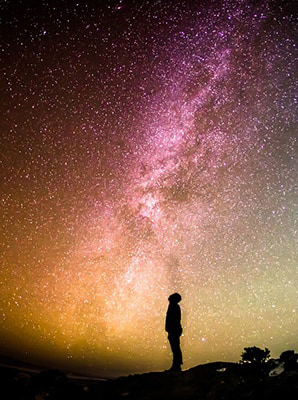 Just the thing for a scifi romance author busily writing about interstellar chaos and danger! 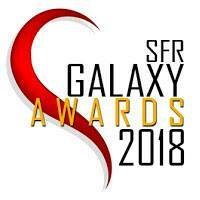 Best Selling Science Fiction, Fantasy & Paranormal Romance author, as well as the “SciFi Encounters” columnist for the USA Today Happy Ever After blog, Veronica Scott grew up in a house with a library as its heart. Dad loved science fiction, Mom loved ancient history and Veronica thought there needed to be more romance in everything. When she ran out of books to read, she started writing her own stories. 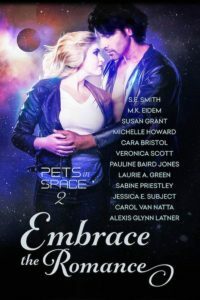 Veronica is the author of Star Cruise: Songbird in the Embrace the Romance: Pets In Space 2 anthology. 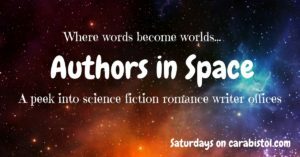 This entry was posted in Author interviews, Guest blogs and tagged antique desk, author offices, Authors in Space, cats and authors, Embrace the Romance: Pets in Space 2, family heirlooms, fiction writing, habits of writers, science fiction romance, Star Cruise: Songbird, Veronica Scott, where writers write. Bookmark the permalink. Yes, I’m very grateful that I inherited the desk, and that my late mother-in-law had it rebuilt becaus eit was pretty tottery when it came to me. I remember my grandmother sitting and writing letters on it, in her dressing room, when I was a little girl. Thanks for having me as a guest today! Thanks for opening up your office! I love that you write on an antique desk. How fun to see where you work! Love the desk and the tchotchkes! You write good stiff there! Oh my, spell check fail. You write good STUFF there! How fortunate you are to have such a wonderful antique with terrific memories. I’m looking forward to Pets In Space 2. Best wishes. Fun post! I’m intrigued by what looks like a horse-drawn chariot and archer on top of your desk. 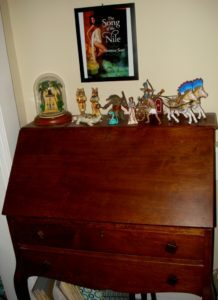 What a wonderful family heirloom to have for your writing space. How awesome to have a desk with such history attached.